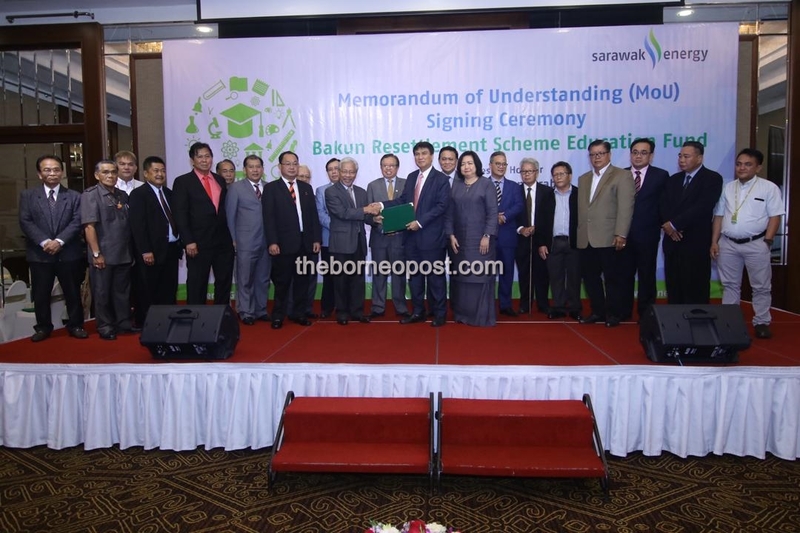 KUCHING: Sarawak Energy is allocating a total of RM600,000 for educational incentives for the resettled communities of Bakun, Murum and Batang Ai through the Bakun Charitable Trust this year. The state-owned energy development group will also provide an additional RM200,000 to the revolving fund to be placed under the care of the Trust to help meet the specific educational needs of the Bakun Resettlement Scheme. This new social investment, which follows the acquisition of Bakun hydropower plant operator Sarawak Hidro from the Ministry of Finance in 2017, was marked today with the signing of a Memorandum of Understanding (MoU) between Sarawak Energy and the Bakun Charitable Trust which was witnessed by Chief Minister Datuk Patinggi Abang Johari Tun Openg at a leading hotel here. Sarawak Energy Group chief executive officer Datu Sharbini Suhaili and executive vice president for Corporate Services Aisah Eden signed on behalf of Sarawak Energy while Bakun Charitable Trust was represented by its chairman Tan Sri Datuk Amar Dr James Jemut Masing who is also Deputy Chief Minister as well as Murum assemblyman Kennedy Chukpai Ugon. The fund will be used to provide educational incentives to encourage academic excellence for primary and secondary students from the area as well as financial aid for further studies at higher learning institutions. The fund will also be used for other educational development programme as well as to improve learning facilities for the benefit of the Kayan, Kenyah, Kajang and Penan communities in 15 long houses in the Bakun Resettlement Scheme. “I believe that with the assistance channeled by Sarawak Energy, this can strengthen the ties between the local communities and Sarawak Energy as a state-owner company which manages our energy in Sarawak,” said Abang Johari. Meanwhile, Sarawak Energy chairman Datuk Amar Abdul Hamed Sepawi said the state-owner energy developer has a strong sense of responsibility towards the people of Sarawak, especially those affected by its projects. “We want to build and leave a positive and lasting legacy by partnering with communities affected by our projects for sustainable collaborations in these areas of education and young people; culture and heritage; community development and entrepreneurship as well as environmental management and conservation,” he said, adding that Sarawak Energy recognised the importance of education in helping any community to prosper. Also present were Utilities Minister Dato Sri Dr Stephen Rundi Utom, Assistant Minister of Rural Electricity Datuk Dr Abdul Rahman Junaidi, Assistant Minister of Water Supply Datuk Liwan Lagang and Assistant Minister of Industries and Investment Malcolm Mussen Lamoh.